Learn how to palm a coin from celebrity magician Matt Wayne in this Howcast video. I&apos;m going to show you how to make a coin appear, just using your hands. Watch one hand. Shown empty, closed, watch. Just give a magical gesture, perhaps a little snap. And look. A coin appears. It works by a contraction of the muscles in your right hand, or your left hand, if you&apos;re a left hander. The coin is placed at the base of the hand. The muscles are then contracted when you bring your thumb a little closer to the forefinger. Notice how the thumb comes in, the muscle will then go over the coin. From the front, this looks very, very natural. Okay? This is not natural. This is natural. Not natural, natural. Over time as you practice this, you&apos;ll be able to place your hand down on a table then pick it back up. You&apos;ll be able to then conceal coins without anyone knowing. For the trick that I just showed you, making a coin up here, all you have to do is show your left hand empty, keeping the concealed coin in your classic palm position, showing the hand empty. 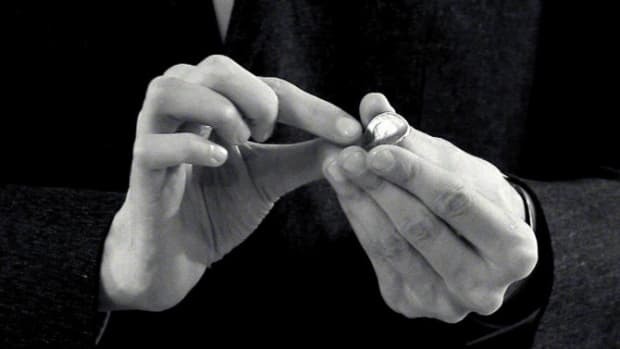 As you bring the right hand concealing the coin, over your left hand, you&apos;re going to drop this coin into your left hand as you turn over your left hand and give a tap with the right hand. You can then give a snap, turn the left hand over, and then open to expose the coin. And you have a miracle. Now, the second variation is a little subtlety, and it&apos;s how I personally prefer to perform it. It&apos;s by showing the left empty, coming over and instead of putting in the fist like this as you&apos;re turning over and then exposing the coin, I prefer to drop the coin like this and then turn over. A little variation. You pick whatever works for you. So I wish you luck with mastering the classic palm, because it is the basis for all of your coin magic.